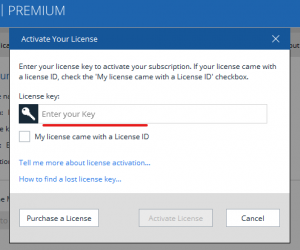 How to activate a new license for Malwarebytes Premium. The Computer Monkey is an authorized reseller of Malwarebytes Premium. Malwarebytes Premium is an outstanding product for preventing and removing malware infections. Go to the bottom of this page for purchasing information. If you have completed your purchase of malwarebytes, the following instructions show how to change or activate your product using your new license key. 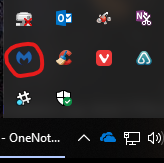 Open Malwarebytes using the icon on your desktop or in the notifications area of your computer desktop. Or use Finder to locate Malwarebytes on a Mac. 2. Click on “My Account” which will take you to the Account Details tab. Then click “Change License Key”. If your license has already expired you may have to close a window and choose “Activate License”. 3. Accurately enter your new license key and click “Activate License” and you are finished. 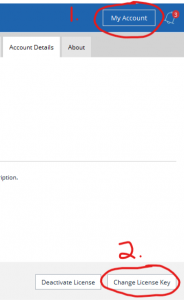 You can now close Malwarebytes. Customers who purchase Malwarebytes Premium directly from The Computer Monkey, receive free remote support of the product as well, but if you would rather purchase it directly from Malwarebytes a link is available through our resources page.